Listed below are the areas of focus that together form a Content Crusader Programme. My services are modular so they can be done in iterations and some can be done parallel to each other. Each activity offers value in itself. I can help you with one or with all. Depending on what your needs and organisational capabilities are, I can also devise the best package of activities to give you the most return on your objectives and suit your organisational conditions. 1. Develop your customer personas to clarify, sharpen, and deepen your understanding of your customers. Customer personas form the core of any content and social marketing strategy. I’ll help you get deeper and actionable insights on your target audience’s decision making cycle vis a vis your value proposition, selling cycle or marketing targets. We can then see which touchpoints can best be supported by content and social media, and how to better optimise content for discovery and conversion. Your Content Zone of Authority is the niche where you can be both competent and passionate in content creation, while preserving utility for your target groups. We’ll pinpoint the sweet spot between your persona’s needs and your value proposition in order to derive cornerstone themes and topics for your business. This will help you chart a content roadmap for your customers. A Content Roadmap helps you stay relevant in all points of choice of your audience. Based on persona and their information needs, your content authority niche, and your business objectives, we’ll identify the compelling themes and topics throughout the customer’s decision-making journey. I’ll pinpoint content gaps and opportunities in each phase so you can better plan which content to develop. Your MVC is a means to deliver strategic content that provides real value for customers. It enables you to test assumptions and learn from feedback. It’s the basic version of a media resource you can create or optimise to address your most urgent content roadmap points. It’s minimum so we can elevate what’s important and create focus to make it more compelling. The success of your MVC depends heavily on the presence of other strategic elements or business structures. I can help you boost your efforts in these areas, or lay down the foundation and get you started. The content you make and share should reflect what you stand for and help fulfill what you promised to the people that matters to your business. I can help you start the process of crafting your brand identity while at the same time get your content efforts to take off. An optimised brand is centred on helping its audience make a choice and move forward towards the action the brand wants to cause. It unifies and focuses visual and verbal language at all customer touchpoints. Doing so results in increased market visibility and memorable presence on- and offline. I’ll help you develop benefits-oriented messaging, define how to bring the brand to life at every point of choice, and discover more ways to enhance customer delight. Based on the decisions made in the branding and content roadmap activities, we will select the major brand story we want to communicate for your business activity, i.e. pre-launch, launch, and immediate post-launch period, campaign, events, and the like. Developing a smart way of creating content efficiently is neither strategic nor sustainable without a system to capture learnings. I’ll help you develop workflows and structures for testing what you implement and acting quickly on needed changes. This way we can streamline the practice of capturing insights and feeding it back into the next incremental development. 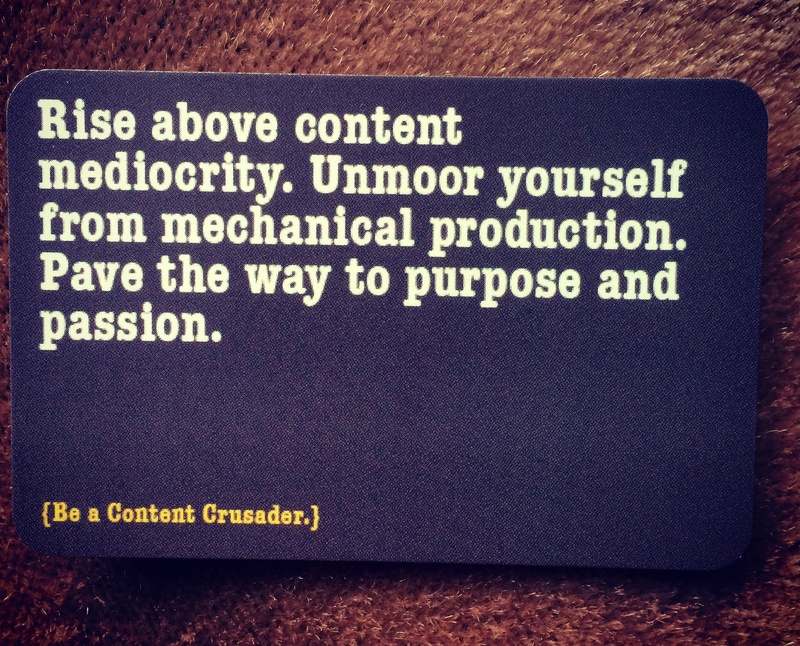 Curious to see if a Content Crusader Programme fits you and your organisation? Let’s do a workshop first. You’ll see what it means to be strategic with content while jumpstarting your content marketing planning. Read more details about the Content Workshop. I’m in the early stage of developing an online course for small business and entrepreneurs. If you’d like updates (i.e. topics to be covered, registration, launch date, other course-related announcements), please sign up for my list. Sign up for updates on the MVC online course. Please send me a message via the form below and I’ll do my best to give you more clarity.